Tribal areas of the eastern region of India are somewhat secluded because of the admission restriction and non-accessibility of these zones. But the one thing that's going to fascinate any visitor is the multihued cultural heritage that possessed by these areas and its people. One of the reasons why the North Eastern States are known as the places where hospitality is religion. Day 1 : Arrive Delhi/Kolkata and transfer to hotel for an overnight stay. 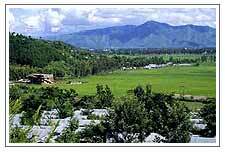 Day 3 : Imphal: Visit Manipur tribal villages, IInd World War Cemetery, museum, emporium and local market. Day 4 : Imphal: Visit Loktak Lake and Sendra Island. The only floating national park in the world called as Keibul Lamjao National Park 48-km Imphal on the way visit INA museum at Moriang and back to hotel. Day 5 : Drive to Virengte 200-km 9 hrs drive the sub division headquarters of Mizoram state, evening halt at virengte traveller inn. Day 6 : Drive to Aizwal 100-km 6 hrs. En route visit Mizo tribal village, evening in the hotel. Day 7 : Aizwal: Full day visit at Mizo, tribal villages, museum, emporium and local market. Day 8 : Leave for Champhai the indo-Myanmar border a charming scenic town with a view of famous Burness mountain ranges. Halt at Champhai tourist lodge. Day 9 : After breakfast sigh seeing in and around Champhai town and back to Aizawal, overnight stay hotel.